Many colleges and universities offer accelerated degree programs (ADP), which let students earn their undergraduate and graduate degrees faster than the normal curriculum schedule. It sounds great, so why don’t all students take the ADP route? That’s not an easy question to answer. For some students, an accelerated degree program doesn’t make sense. They might prefer a more traditional, semester-based model where they attend class two or three days a week and complete their coursework over a more leisurely paced 16 weeks. Many accelerated programs are offered online or during evenings and weekends. For students looking for a more traditional, campus-based college experience, going the ADP route is probably not their best option. For those who want to complete their degree in less time, particularly working adults who are balancing work, family, and other responsibilities along with their education, the accelerated route is often an ideal choice. However, it’s important to remember that not all accelerated degree programs are created equal. Some accelerated programs are willing to sacrifice quality for speed. Some might have qualified faculty developing the coursework, but less-qualified instructors actually teaching the courses. Still others might rely too heavily on textbooks and not enough on hands-on assignments and robust discussions with professors and classmates. When choosing the accelerated degree program that will work for you, it’s important to think about what you value most and then find the program that provides it. Here are 10 things to consider as you evaluate accelerated degree programs to help you make the right choice. We also have a PDF version, which you can print and keep with you as you’re exploring. 1. Faculty Qualifications: Do faculty teaching the courses have advanced degrees in the subjects they teach AND relevant professional experience? They should! 2. Return on Investment: According to the U.S. Census Bureau, people with college degrees earn nearly double what those without a college degree earn; and those with advanced degrees earn three times as much. So, going back to school definitely makes sense. But, you shouldn’t be the only investor in your education. Choose a university that feels it’s making an investment in you! If you contact a university and the admissions counselor is more interested in telling you why you should enroll instead of listening to what you want, it’s probably a good idea to look elsewhere. 3. Speed and Quality: An accelerated degree program can make it possible to earn your degree more quickly, but be careful not to forsake quality for speed. Ask questions about the amount of time you should expect to devote to your studies, and then choose the program that will allow for the right balance between speed and academic quality. 4. 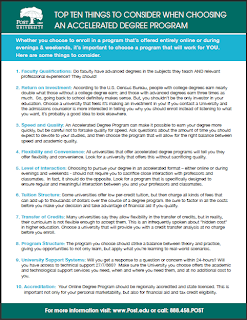 Flexibility and Convenience: All universities that offer accelerated degree programs will tell you they offer flexibility and convenience. Look for a university that offers this without sacrificing quality. 5. Level of Interaction: Choosing to pursue your degree in an accelerated format — either online or during evenings and weekends — should not require you to sacrifice close interaction with professors and classmates. In fact, it should do the opposite. Look for a program that is specifically designed to ensure regular and meaningful interaction between you and your professors and classmates. 6. Tuition Structure: Some universities offer low per-credit tuition, but then charge all kinds of fees that can add up to thousands of dollars over the course of a degree program. Be sure to factor in all the costs before you make your decision and take advantage of financial aid if you qualify. 7. Transfer of Credits: Many universities say they allow flexibility in the transfer of credits, but in reality, their curriculum is not flexible enough to accept them. This is an infrequently spoken about “hidden cost” in higher education. Choose a university that will provide you with a credit transfer analysis at no charge before you enroll. 8. Program Structure: The program you choose should strike a balance between theory and practice, giving you opportunities to not only learn, but apply what you’re learning to real-world scenarios. 9. University Support Systems: Will you get a response to a question or concern within 24 hours? Will you have access to technical support 27/7/365? Make sure the university you choose offers the academic and technological support services you need, when and where you need them, and at no additional cost to you. 10. Accreditation: Your online degree program should be regionally accredited and state licensed. This is important not only for your personal marketability, but also for financial aid and tax credit eligibility. If you have any questions about accelerated degree programs, feel free to leave a comment here or send me a note. Does your assessment of our online MBA degree program agree with your peers'? Veronica, you make some great points. I received my BS from Post University while working full time through the evening and weekend accelerated degree program. While convenience was a big factor, my biggest asset were the adjunct professors who brought real life experiences to the classroom. I took these taught experiences to the workplace for my own personal professional growth.